There's one thing that all of us have to go through when we are that is creating a new website and that is choosing the correct domain name. It is so important to choose the right domain for your site. Something that your customers are going to remember off the top of their head, something that looks professional, and most importantly something that suits your website. Not only do you have to consider this, however; there's also the issue of whether your chosen URL is taken, or even whether your URL could mislead potential customers. Why new domain suffixes are being released. In theory, the new suffixes – everything from .baby to .books and more – should help website owners to create new, interesting domain names. There is a whole assortment of new URLs that can be established and used with the release of these new suffixes. With a little bit of creativity, businesses can create memorable, to-the-point URLs that catch their customers' attention. New TLD's – will these new suffixes help Google Ranking? The real question concerning the TLDs is will these new suffixes help? Well, according to Google engineer Matt Cutts, they give your Google rankings a boost. Back in 2012, Matt Cutts reassured us all on his Google+ account. That the new Top Level Domains (TLDs) would not receive favourable treatment over the TLDs, we are used to, such as .com and .org. Good news for anyone who wants to stick with their .com domain, but what does this mean for anyone who gets a new TLD? It means that to achieve anything with the new suffixes, you have to do the same thing you would do with any website. There is no easy, one-step way to get instant ratings on Google, no matter what anyone wants you to believe. To improve your Google rankings, you need a site that people want to visit. A website that is both informative and attractive with well-done content and no attempts at spamming. Moreover, most importantly a website that meets your audience's interests; one that caters to your audience's interest and not to yours. 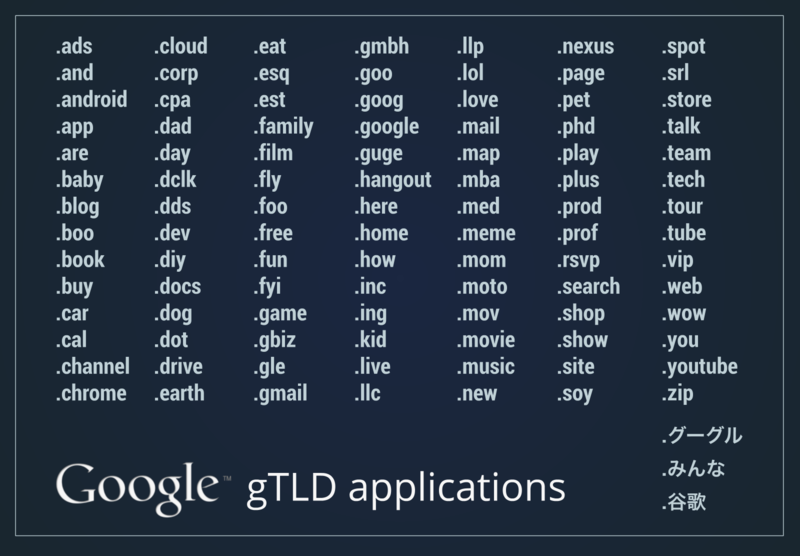 Google certainly seems to be an advocate of the new TLDs despite this; they've applied for 101 different TLDs, from the obvious like .Google and .YouTube to TLDs that weren't quite as expected such as .baby and .lol – a full list of the TLDs they applied for can be seen here, on Google's official blog2. On the other end of the spectrum, however, is Apple, who applied for only one TLD, .apple. In total, almost 2,000 TLDs were created, including the first generic Arabic online suffix, شبكة (pronounced dot shabaka). Will the new TLDs catch on? So, will the new TLDs catch on and stick with us for years to come? Alternatively, will they fall short? Only time can tell. The internet is always changing, but at the same time, its patrons hate change with an unbridled passion. Whether or not the new domain suffixes stick depends on if the site is good enough, people will come to it no matter what it is called. The rules of the internet have not changed; good content wins out over a good URL. What Google officially say about the new top-level domain names.